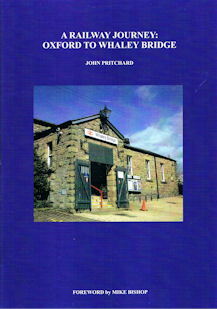 John Pritchard, a founder member of Friends of Whaley Bridge Station, has written this book to celebrate the 10th Anniversary of the Friends of Whaley Bridge Station. It recalls some ' railway-related' reminiscences on the author's journey from Oxford to Whaley Bridge. The book describes why and how the group was formed and what the group did achieve along the road to Station restoration Day. Card cover, 106 pages.